A British institution and byword for outdoor beauty, the company make the unpredictable state of nature that bit easier to properly manage. Drawing deeply from traditional designs from the 1800s, KENT & STOWE's range of tools will astound everyone, from casual gardeners to experienced landscapers. Each piece is designed in the United Kingdom by passionate people who fuse the ideas from long ago with modern technology for a finished product that treads a line between both worlds. 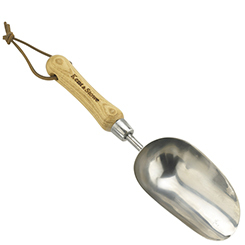 Using only the finest materials, most of KENT & STOWE's trowels, forks and cultivators are fitted with wooden handles for a superior grip and refined look that will complement any potting shed. High-quality metalwork ensures a corrosion-free finish, allowing the instruments to withstand all that nature and time have to throw at them. Proudly marked with the brand's name, just using the tools will lend a distinguished touch to a sunny day in a garden. The range of pruners, sheers and secateurs really highlight the inclusion of modern mechanisms. Masterfully crafted non-stick blades fashioned from sturdy metal take the stress and little annoyances out of what should be a series of relaxing tasks. Compact and elegantly structured, the smaller items hold the same refined look that completes the lengthier tools. Practical and polished, every KENT & STOWE item carries a sense of charm that is seldom found in most garden sheds.